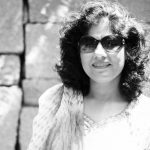 A few days Back a friend had gone to her home town – Bareilly. 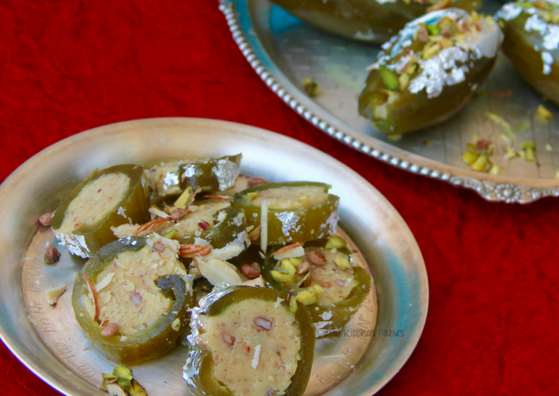 Amongst other things Bareilly is also very famous for an interesting sweet made from Pointed Gourd or Parwal. My eldest uncle was posted in Bareilly and he used to bring this sweet with him every time he came home. Later on when my brother was posted in Bareilly he too made it a point to bring home a box. 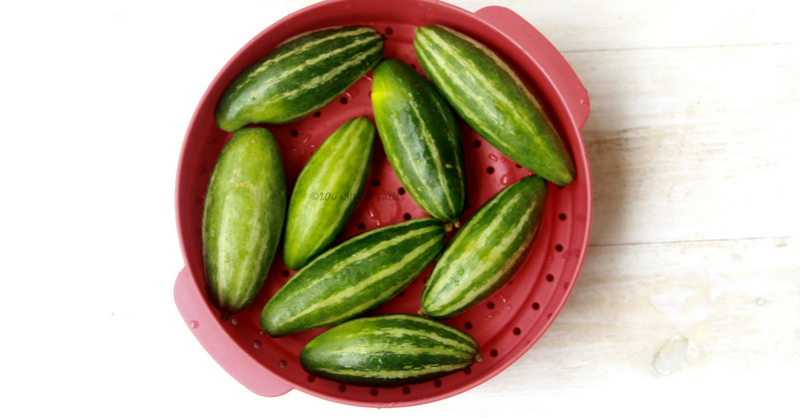 Pointed Gourd or Parwal is not very common in Bengaluru. Fortunately, on my last two visits to the local vegetable market I found it available and that inspired me to pick up a few to make this sweet dish. Sometimes I wonder who decides the recipe for the day, me or the foods themselves ! This sweet is fairly easy to make but as they say the devil lies in the details. Peal the outer skin of the Parwal nicely, as the skin is chewy and we want an outer-shell which is a bit crisp. Do not overcook the Parwal in Syrup. If the Syrup gets too thick , there will be a sugar crystal coating on the Parwal. This sweet is usually served whole but now a days, since most of us are watching our sugar consumption, I cut the Parwal into smaller pieces so that every one can have as much as they want and it looks lovely too. Wash and peal the parwal. Slit the parwal length wise from one side and gently take out all the seed to create a cavity. Boil water in a large vessel. Once the water starts boiling place the parwal in it. Let the water boil for two - three minutes and then switch off the flame. After 30 minutes take out the parwal and put it in a strainer. Ensure all the water comes out of the cavity. In a Pan put sugar, water , saffron the the cardamom pods to make syrup. When the sugar dissolves and syrup starts boiling put parwal in the syrup. Turn parwal every 3 to 4 minutes. When parwal start changing colour and syrup is of single thread consistency, switch off the flame. ( Single thread consistency is when a drop of syrup at room temperature is pressed between two fingers and you open your fingers a single thread is formed ). Leave parwal in Syrup for 30 minutes. Powder sugar and cardamom seeds in a dry grinder and then add almond and pulse so that the almonds are coarsely powdered while sugar and cardamom are finely powdered. Take the parwal out of the sugar syrup and put it in a strainer. Turn them upside down to take out all the syrup. Fill the mawa mixture gently. 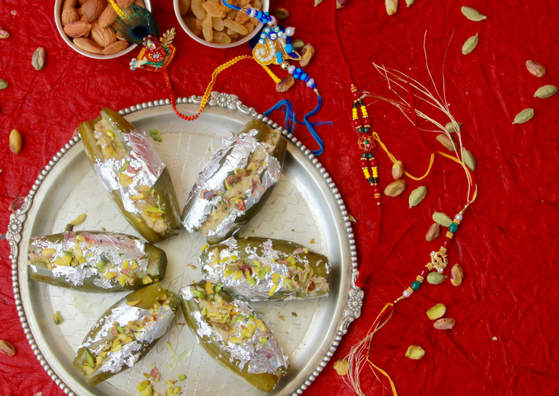 Decorate with silver foil and chopped pistachio. You can store in the fridge for upto a week. Never thought of parwal as a base for a sweet! Lovely recipe. Thanks Sujata. 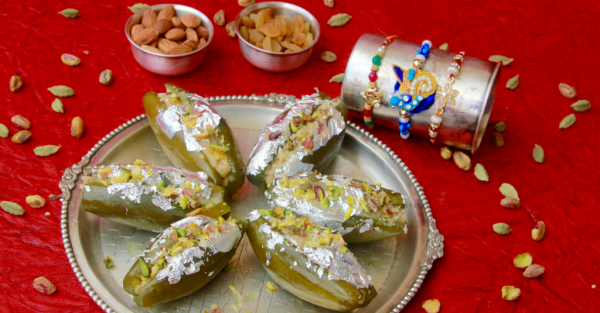 It is a very unusual sweet, available mostly in a Bareilly , Varanasi and a few other cities in North .